Longhorn Cavern was formed over tens of thousands of years by an underground river. That river created the cavern by erosion on its way to the local aquafer formed subterranean lakes along the way. Over time several cave "chimneys" were formed opening to the surface. This left large rooms below. Most of the cavern was filled with mud and rock debris left behind by the flowing water. 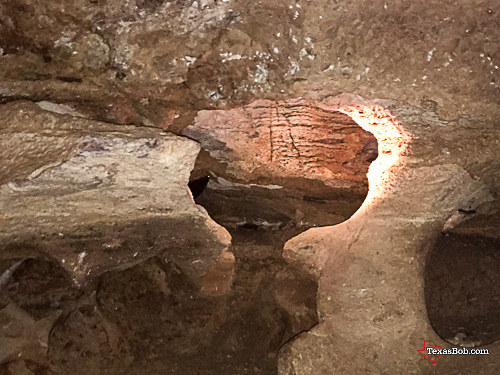 In the early 1800's the Comanche Indians used one of the cavern rooms, since named "Indian Council Room". In the 1860, during the Civil War, the confederate army forced the Comanche's out of the cavern and set up the production of gun powered using the large amount of bat guano as the raw material which is rich in nitrogen. In the latter part of the 19th century the caverns were for the most part left alone and land around the caverns were used as ranch land for raising cattle. On more than one occasion one of the longhorn cattle would graze too close to the one of the several natural entrances to the cavern and fall to their death. From that point forward the cave became known as "Longhorn Caverns". 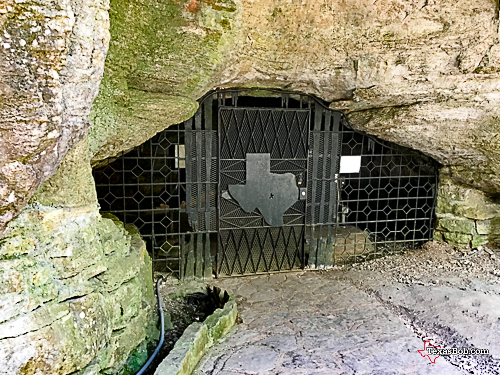 In 1920 after the passing of the eighteenth amendment of the U S Constitution banning the manufacturing, selling or consuming alcoholic beverages a local entrepreneur opened a fine restaurant in one of the large rooms in Longhorn Cavern. It was all lit by kerosene lanterns and candles. There was a dance floor, live music and alcoholic beverages. The kitchen was on the surface, next to a "chimney" opening down to the dining area. Prepared food came down into the cavern on a dumb waiter and dirty dishes went up on the dumb waiter. Business was good until the great depression of 1929. The State of Texas purchased Longhorn Cavern and the surrounding ranch land in 1931 to be used as a state park. The Civilian Conservation Corp (CCC) set up camp at Longhorn Caverns in 1933. The CCC was a depression era employment program for young men. There were camps all over Texas and all over the United States. They mostly did conservation and forestry work. They worked six days a week and beside room and board they were paid $30 a month and were required to send $25 home. So what was the CCC doing at Longhorn Cavern? Although the cavern rooms had been used for many different things for many years, most of the cavern was still filled with thousands of years of rock and mud. The CCC men were here to clean out the cavern one shovel full at a time. With pick, shovel, and wheel barrow in hand the work began. One crew worked in the cave, another crew, using the material coming out of the cavern, built dikes around the cavern to prevent flowing water from refilling the cavern with debris. Yet another crew took the material and built Park Road 4. Then there were tradesmen and apprentices that built the buildings in Longhorn Cavern State Park from material from out of the cavern and rock surrounding area. It was a big job and they did not finish until 1938. The walking tour of Longhorn Cavern is good for all ages. It is only about 1.2 miles and once you go down about 40 steps the rest of the tour is reasonably level. It would be a good outing for families with children. Can I guarantee you won't have to carry your three year out of the cavern? No, but if you do have to carry them out, it will not be difficult. If you're a senior citizen like me and have reasonable mobility you can make and enjoy this tour. If you occasionally use a cane, take it with you and use it. If you are tall, like me there is some stooping and watch for low hanging formations. Wear sensible rubber soled shoes. Everyone in your group needs to take a bathroom break before the tour. There are no facilities in the cave. The tour last about an hour and a half. You can bring your camera on the walking tour. The cavern is not wheel chair accessible or ADA compliant. 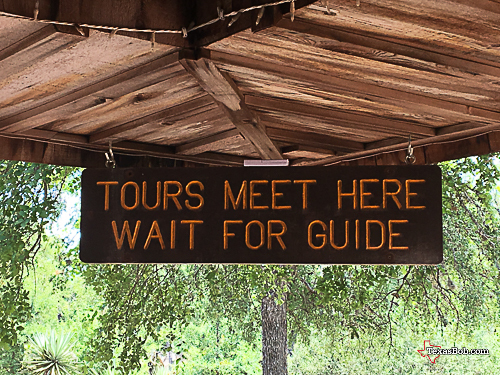 The tour guides are great. Follow the rules and listen to your guide and all will go well. This where the tour begins. Located right out the back door of the visitor center.